The financial crisis is all over the news. Doom & Gloom!! 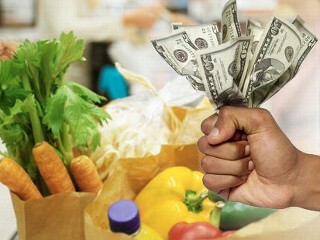 With soaring prices in everything from gas at the pump to milk at the grocery store....everyone is feeling the crunch. My family is no exception. Three weeks ago, I went to a friend's house where she educated us all about couponing and how to get things for the cheapest price possible. I have to tell you, this is very difficult for me for a few reasons. #1: I am a recipe cook. I prefer to have my weekly recipes and go shopping for those ingredients. When you are couponing, you need to reshape how you think about things. You don't necessarily buy something because you need it now, you buy it for the future. So in essence you are creating a pantry stockpile. From this stockpile you create your meals. This is the difficult part for me.....because I just simply don't want to think about it!! My friend told me about a site called allrecipes.com. You enter the ingredients that you have and those that you don't want and it creates a recipe for you. O.K. so there goes that excuse! #2: I don't have the time! 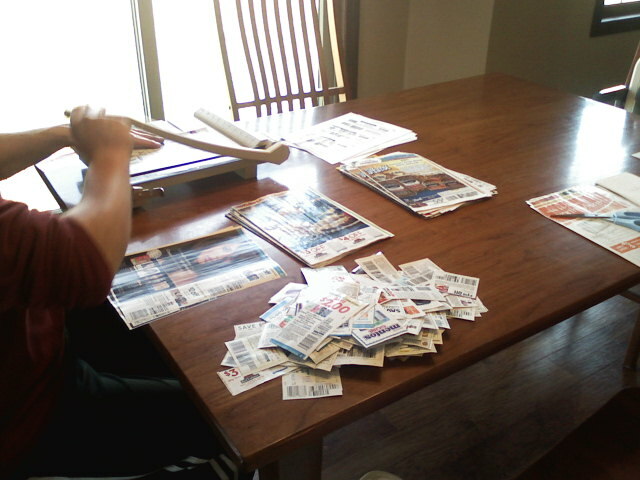 It takes way too long to clip out all the coupons, and then sort through the ads to figure out what I'm going to buy. Here is the answer I was given. It will take a good bit of time in the beginning to get everything cut out and seperated. Once you get a good stockpile (4-5 weeks worth) of coupons it will be much easier to line up your coupons with the sales ads. Plus, my awesome hubby has volunteered to help in anyway he can. Excuse #2 gone! So, here is where I am in the process. I am in week 4 (if you include the week there were no coupons published for the paper). Every Sunday, I go out an buy 2 copies of the Sunday paper and clip out the coupons. I had quite a few to clip, since I waited until yesterday to do it. Here is my sweet hubby helping me cut them out. 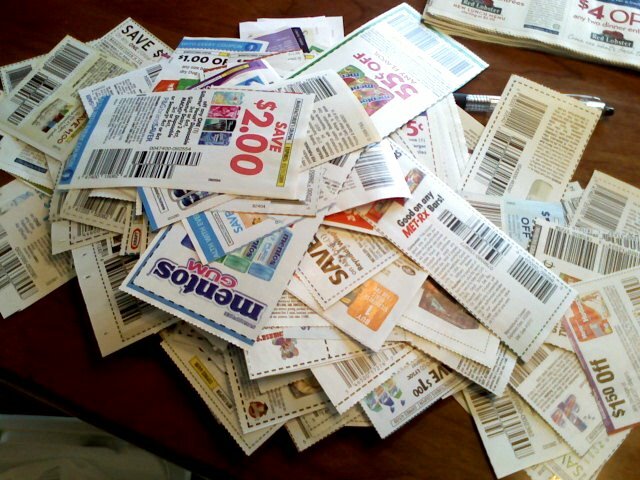 My clipped out coupons, waiting for to be sorted. My sorted coupons by category. i.e. Frozen Foods, Dairy, Cleaning Products, Baby Items, etc. 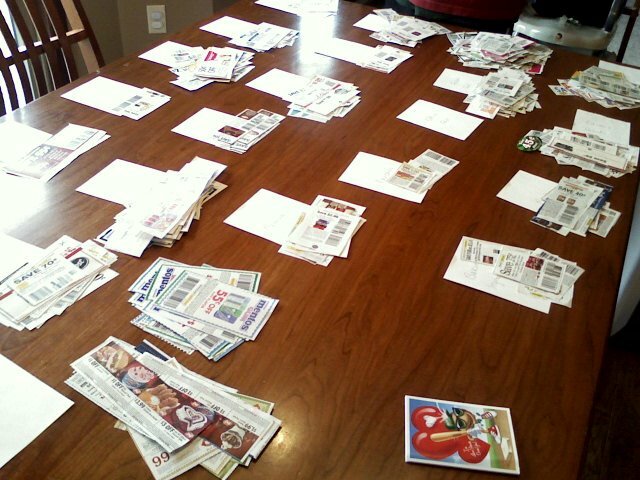 My next step is to purchase a binder, divider pages, and baseball card sleeves to further organize my coupons. I feel that by doing this I will be saving my family a ton of money at the grocery store. This will help free up the money we were spending on food so that we can redirect it to help pay down other debt...and hopefully pay off our mortgage earlier. Thanks for the link love and hurray for couponing! Another tip is get your newspaper delivered not only is it cheaper but often the coupons are higher value in the delivered paper than the ones on the newstand. I am planning to start this myself! Hopefully within the next couple of weeks! It's going to be a process, but I want to do it! I have tried the whole couponing thing and just can't get into it. Maybe I need to try it again, but I really hate grocery shopping anyway. Hope it works for you! See I totally agree it takes a LOT of time. I have been couponing on and off for 2 years and the main reason I fall off the wagon again and again is the time commitment. I've tried to the coupon thing as well. I also had a spreadsheet of where I could get the best deal at the places where I could do my shopping. I now throw my coupons in a blue tiny basket and try to remember to go through them before I go the store. The ones that I don't use, I lay in a place where others can partake in the savings. No need to throw away money when someone else can benefit from them. I love the idea of it and would totally do it, but the stuff we buy NEVER has coupons! The bulk of our groceries is produce, or is from specialty stores like Trader Joe's and they just don't put out coupons like "normal" grocery stores. It frustrates me, b/c Marvin hounds me about it all the time, so I'll do it for things like paper towels or toilet paper, but that's about all I can do! Arrrrrgh! I went to Missy's class tonight. It was great and so inspiring for us all to do well at this. I see your cutting board in the pictures. A lady there tonight suggested using a craft board and a box cutter. I came home and used my regular Pampered Chef cutting board and a utility knife. Works great and very quick! Ordered my sheet protectors online tonight. Good luck! I really need to start doing this and buying only what I have a coupon for. Groceries are SOOOO expensive. Great post. I'm so with you on this. My hubby works for our local paper so i get the Sunday paper free every monday. Several friends have told me to get more than one paper. I guess i'm going to have to bat my eyes and use the It will save us sooo much money in the long run speech! I love the post. I just started clipping coupons and was so excited when I saved twenty bucks I thought I could do it again the next week. Hmmm doesn't work to well that way. But I keep going. Yay!! Great post!! Man did we hit the jackpot this week!!! Have you seen the ads? Are you beginning to see results?? Have fun! I tried the binder method and it is a PAIN, especially if you have a lot of coupons. I'm going to switch over to a shallow box with lots of room and dividers. That way you don't have to deal with them individually, just as a group pile.